March is just gone and what we really liked of this month is seeing Santa Maria al Bagno on the cover of Geo Saison, important travel magazine, which every month gives to the Germans ideas and opinions about travels and worldwide destinations. 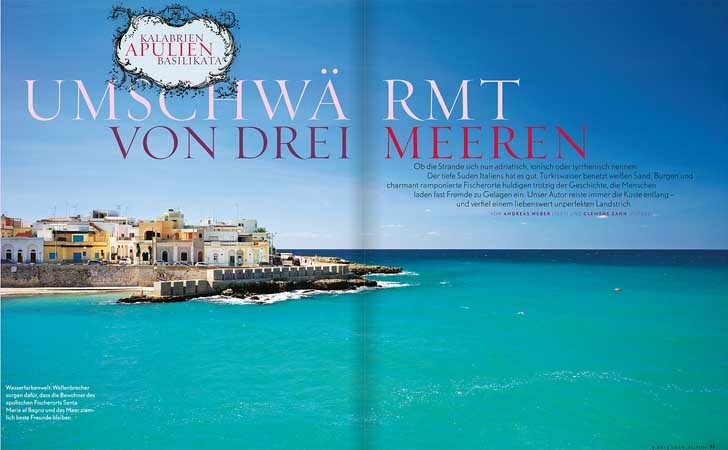 “Italien, die romantik des suden” – Italy, the romance of the south – this is the headline that the german magazine, Geo Saison, dedicates to the South Italy and particularly to Puglia, Basilicata e Calabria regions. Once again Santa Maria al Bagno is under the spotlight of the international press, you will find it on the cover and on a splendid double-page that opens this special article on Geo Saison. “An den Küsten von Apulien, der Basilikata und Kalabrien finden Reisende biblische Landschaften, Fischerdörfer und ein Meer, das zwar dreimal den Namen wechselt, aber nicht sein triumphales Türkis. Dort im Süden fühlt man sich schneller heimisch, als man “Pasta” sagen kann” – On the coasts of Puglia, Basilicata and Calabria travelers find biblical landscapes, fishing villages and a sea that changes three times its name, but not its triumphant turquoise. Here in the south, you will feel at home faster than you can say “pasta”.